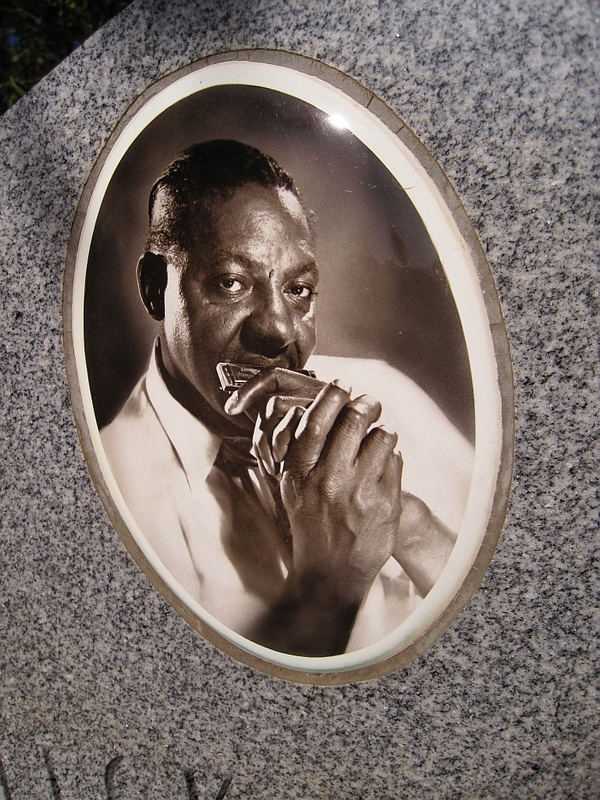 TBT: Sonny Boy Williamson, "Nine Below Zero". It hasn't quite made it to nine below zero here in New York yet--well, maybe on the Centigrade scale--but it's sure felt like a shock after our mostly balmy December. Still, it's an appropriate time for this blues, led and sung by the greatest of blues harmonicists, Sonny Boy Williamson. Born a sharecropper's son in Mississippi, like many great blues artists he found his way to Chicago and to Leonard Chess, for whose Chess label he recorded. 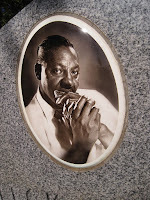 The clip above shows him playing and singing "Nine Below Zero", with Otis Spann on piano, Willie Dixon on bass, and Matt "Guitar" Murphy. If one of my blues maven friends can ID the drummer, I'll be grateful. The photo, by Thomas R Machnitzki, is of Sonny Boy's gravestone, in the Prairie View Cemetery at Tutwiler, Mississippi. I'll start with remembrances. 2015 took a heavy toll of those I knew and loved, and those I admired. At the beginning of April, my phone rang and Heather Quinlan gave me the shocking news that John Loscalzo, a.k.a. "Homer Fink", founder and publisher of the Brooklyn Heights Blog, had died suddenly and unexpectedly of, as it was later determined, an aneurysm. John left a wife, Tracy Zamot, and a then four year old daughter, Gracie. He also left the BHB crew: Beth, Heather, Teresa, Theo, and me, deeply saddened but determined to keep the Blog going which, with Tracy's support, we've managed to do. I had known John for almost nine years, since he discovered this blog because I posted a photo of a Brooklyn Heights sunset, and invited me to become a contributor to BHB. Over those years, I found John to be a most accommodating publisher, a companion on some amusing adventures, an instructor on the ways of the on-line world and contemporary pop culture and their odd (to me) jargon, and, most of all, a treasured friend. One of those I most looked forward to seeing at my law school reunion in October was my classmate, and later roommate when we first moved to New York, Mario Diaz-Cruz. When we arrived in Cambridge, I saw from the reunion program that he had died just three weeks before. From friends, I learned the details. It had been a brief but fatal illness that struck while he and Sissy, his wife of 45 years, were on vacation in the Hamptons. He was a superb lawyer and friend. Another loss in 2015 was Tania Grossinger, an erstwhile Lion's Head companion whom I wish I had gotten to know better after I read her autobiography Memoir of an Independent Woman. My ecclesiastical home, Grace Church, saw the loss of its Rector Emeritus Goldy Sherrill and of Don Yule, veteran of the New York City Opera and stalwart in the bass section of the Grace Church choir. Others whose passing I've noted here are Ernie Banks, Philip Levine, Lesley Gore, the Left Banke's Michael Brown, Ornette Coleman, Wendell Holmes (whom I had the pleasure of getting to know when the Holmes Brothers were playing at Dan Lynch back in the early 1980s), Yogi Berra (a Yankee hero who became a Met), Frankie Ford, Allen Toussaint, and, most recently, Natalie Cole. No doubt you can think of others I should have similarly honored. Update: somehow I missed B.B. King. Turning to the more pleasant side, I always credit those who have aided my blogging, either through providing me with material or by giving me encouragement, or both. Some of the usual suspects return: Michael Simmons; The Rev. Stephen Muncie; architectural historian Francis Morrone; historical novelist and master of good craic Dermot McEvoy. There are also some new ones: John Wirenius, whom I met in the flesh for the first time at a Sunday evening service at St. Bart's in Manhattan, and who was ordained a Deacon of the Episcopal Church earlier this year; old college friends Larry Brennan and Steve Griffith, as well as Gene Owen, to whom Steve introduced me during the Cosmic American Music Festival in Winter Haven, Florida; Tricia Collins, a for a time long lost Lion's Head companion now back in her hometown, Tallahassee, whom I re-discovered through our common friendship with Kevin Clarke, father of one my daughter's elementary school classmates (in which connection I'll also mention Tom Jenkins); and Permian Extinction--that's her nom de Facebook--whom I met on line because of her friendship with Marian Saska, and whom, because of our common interests in painting and birds, I suspect has in common with Marian connections to the Art Institute of Chicago and the Field Museum. My former LeBoeuf colleague Richard Cole last year gave me a story about his friendship with Robin Williams, and this year allowed me to show him around Brooklyn Heights during a visit to New York; and my law school classmate Richard B. Hoffman has been an invaluable source on movies, theater, law, and much else. I can't end this without mentioning my wife, Martha Foley, and my fellow Robinson Knights, so many of whom I've re-established communication with after many years. If I tried to list you all, along with your contributions to my venture, I'd be up past midnight, and it's a work night. Please accept my heartfelt thanks.